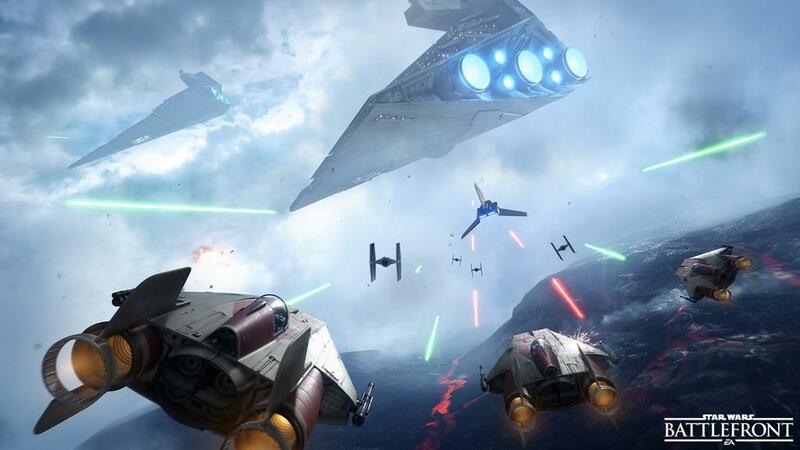 Star Wars fans have been waiting 10 long years for the next installment in the Battlefront series. As heartbroken as they were when the third one was officially canceled, they were elated when news broke that DICE was handling the rebirth of the franchise. The developer has done great things with the Battlefield series, and the hopes were that the same quality would transfer over to Battlefront. 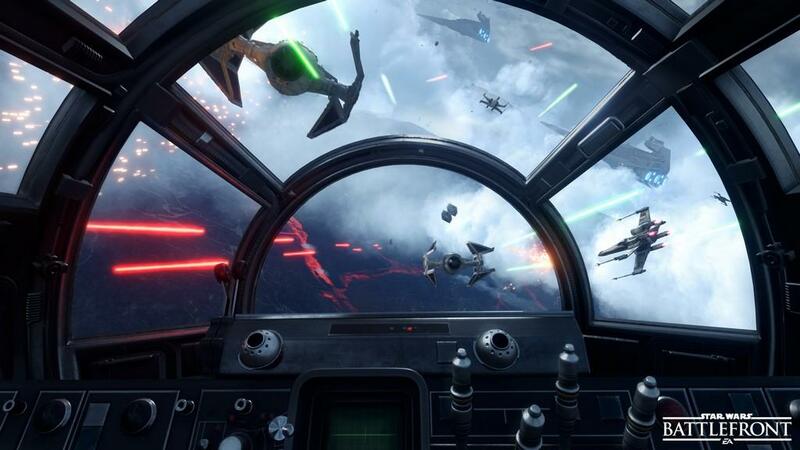 Now that it’s finally here, we have in our hands the best-looking and best-sounding Star Wars game ever made. Unfortunately, almost everything else about the game leaves a lot to be desired. 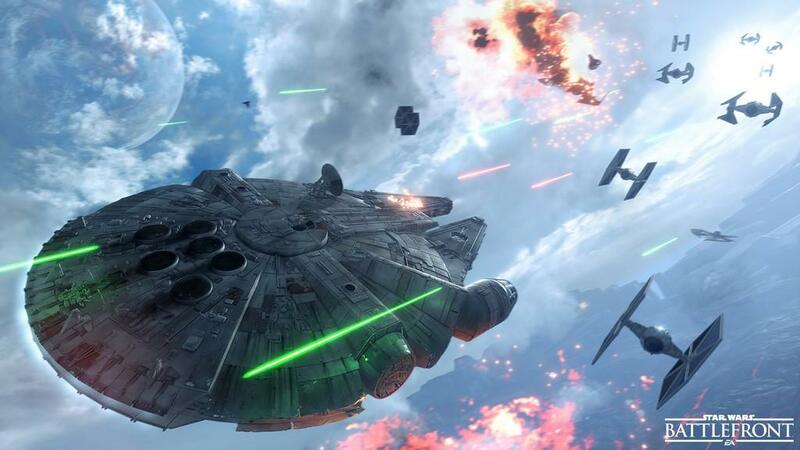 Let me just come out and say it: Star Wars Battlefront is a mixed bag of emotions. Everything, mode-wise, is open and available to you from the start. There is no sort of campaign option present; everything is intended for a multiplayer experience, be it cooperative or competitive. There are a series of training missions that will introduce you to both the game modes and the Heroes and Villains that are available in certain modes. Some of these missions will feature brief cut scenes as their introduction, but, beyond that, there is no substance given in terms of story. These, as well as the horde mode-style missions, are fun in short spurts, but don’t really offer any longevity to the experience. The modes that are available, for the most part, run the gamut of traditional first-person shooters. You have your deathmatch, capture the flag, and control style of games. These aren’t very enjoyable because the game’s mechanics are very limited. 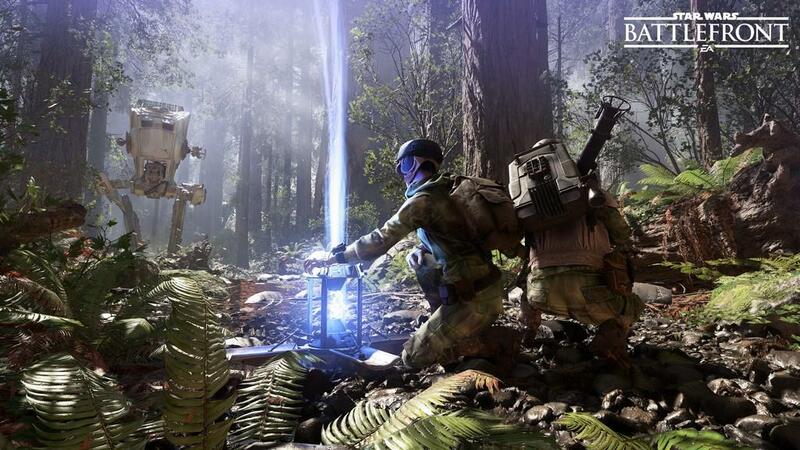 In Battlefront, you have a single weapon which is selected prior to your match, as well as a set of "cards" which give you access to support equipment and a few special weapons. You can’t pick up weapons on the battlefield, and there is no option to upgrade the specs of your favorite blasters. 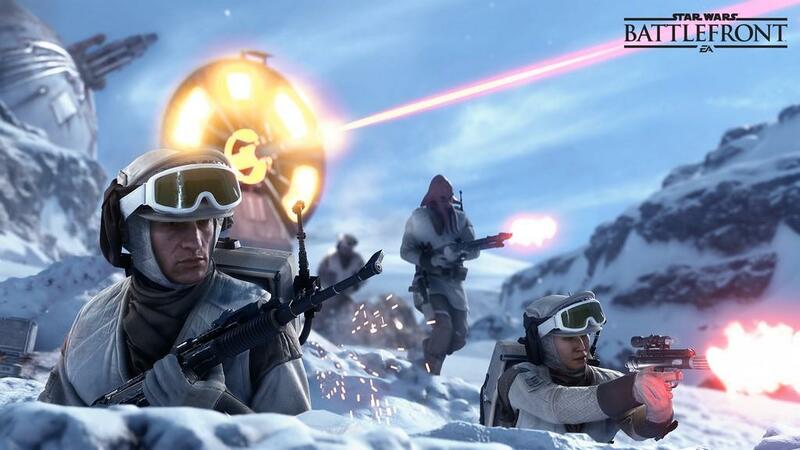 What you can do, however, is unlock new blasters with in-game currency that you earn as you level up. Even with this in play, the overall weapon selection is extremely limited, as the stats of the different guns do not have a ton of variation; it’s all a matter of finding one with high damage and a decent range. The card system is interesting and works well. Much like the various blasters, cards can be purchased with credits earned in matches and equipped to different hands or loadouts. There are two equipment card slots, which will utilize things such as grenades, special blasters (sniper rifles, anti-vehicle launchers), and jet packs. On a side note: Battlefront features the best jetpack I have ever seen in a video game. It is just so “Star Warsy.” The pack is a quick burst that propels you upward and forwards; there is absolutely no finesse to it and it feels dangerous even when you have mastered it. It fits the original Star Wars universe so perfectly. Each of these support slots has a cool down period after each use, but they offer unlimited usage throughout a match. The third, special slot, on the other hand, is powered by icons found throughout the match. You are limited in your usage by the amount of icons that you find and collect. These will trigger more ability-styled perks for your character, such as allowing your weapons to cool down instantly or locating all of the enemies on your radar. This entire card mechanic really goes a long way to making the game feel balanced. Even when you are at a low level (character-wise), you can access the loadouts of another member on your team in order to get some perks that you may not have earned yet. It really works well. Overall, I love the card system and the limited weapon selection, but mainly because it falls in line with the source material in the films. This game is focused on the original trilogy and the technological limitations just feel right. When you try to apply these mechanics to traditional modes that we are used to experiencing in more robust games, the results are lackluster. The game feels too basic in those situations, but when it applies to the other more Star Wars-centric modes, things feel so much better. There are vehicles, and even a vehicle-centric Fighter Squadron mode, but these, too, feel weak on their own. The vehicles work in the confines of large-scale battles, mainly because they aren’t the focus. But when they take the center stage, their shortcomings really shine through. Nearly all of the ground vehicles are fine, just limited in their abilities, but the airborne ships feel sluggish. They may look like they are speeding by you when you are watching them above, but once you are in the cockpit, the action slows to a crawl. What game modes work well, then? Supremacy and Walker Assault work extremely well, thanks to their large-scale settings. When you get 40 players going at it, and there are lasers flying everywhere with players on the ground, in the sky, and marching through in AT-ST and AT-AT walkers, it is truly as if you are in the Star Wars universe. The feeling of scale really shows through, thanks to how much is going on around you. Droid Run and any of the Heroes and Villains game types work pretty well, too, mainly because of their focus being narrowed in on the source material. However, this only gives you roughly four modes worth playing, which means a majority of the content isn’t worth your time. The Heroes and Villains in the game are a lot of fun to play with, but they do not seem balanced and their variety is limited. While there are six in total, Luke, Darth, and Boba Fett are the only ones who are really enjoyable to play. They feel head and shoulders above the other three--Leia, Han, and the Emperor--in terms of their power and abilities. The gap between the two groups is wide and could be adjusted on both sides, nerfing the powerful trio a bit and improving the others at the same time. Although the map selection is limited in terms of overall numbers, I don’t really feel like it hinders the experience much, thanks to the size of the larger stages. The large-scale battles take place on some ridiculously huge maps, and you usually find the battle focusing on a different area with each play. The four planets represented in the game are very diverse and unique, which also helps keep things fresh. Content and game modes aside, I have no problem calling Battlefront the most beautiful game that I have seen this generation. Seriously, this game is breathtakingly gorgeous. Whether it is the glaring sun and stirring dust on Tatooine, the pouring rain and falling branches in the forests of Endor, or the blowing snow and vast whiteness of Hoth, my jaw drops when I explore the maps. The original John Williams score as well as the new tracks mesh perfectly together to highlight the action and events of each and every match. The sound effects are just as authentic and true to the Star Wars experience as the soundtrack. It is truly unbelievable in these departments. Aside from the lackluster amount of modes worth playing, the amount of “extra” content also leaves a lot to be desired. You have a handful of unlockable blasters and cards, as well as a decent variety of cosmetic options (heads and uniforms) for your characters, but that is it. The weapons don’t evolve or change as things go on, which means you will end up finding one you like and staying with it for most of your Battlefront career. There is an in-game diorama that you will eventually unlock set pieces for, but considering that the pieces are practically visible on the set before you earn them, just made transparent, unlocking them really doesn’t do much for me. There are points in time, when playing Battlefront, that it hits on all cylinders and the resulting experience is some of the most fun you can have in gaming. This mainly happens during the large-scale 40-player battles, and the various Heroes and Villains game types. There is just something about the way that it represents the Star Wars universe and how well these particular match types suit the setting. Unfortunately, during most of the other game types and modes, it feels like a very underwhelming, albeit gorgeous, shooter. Things are likely to improve with content updates and the already-announced DLC, but what’s here with the base game leaves me feeling empty. 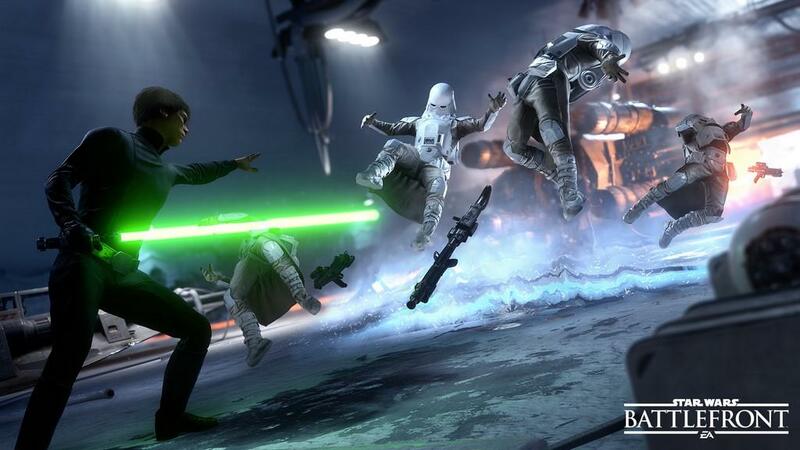 Battlefront can be a lot of fun within a few specific modes. Unfortunately, those moments are only a small portion of the overall experience. While I have no doubt that the game will improve with updates and DLC, what is here in the base game leaves a lot to be desired.